In this age of faceless technology, genuine crafts are a rare find, a welcome sight amidst the mediocrity of mass-production and low cost. 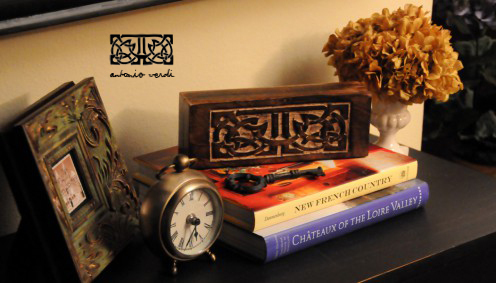 Finding a handcarved item, displaying all of the skill, experience, and artistic talent of the maker is a delightful surprise, a welcome relief from the bland and mundane. 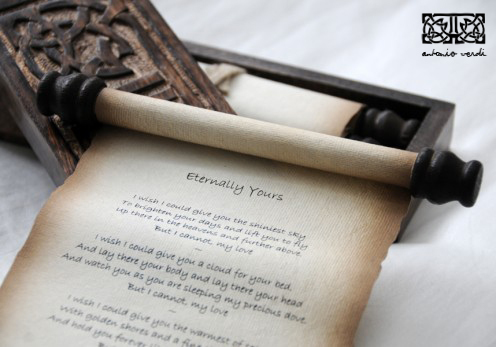 As a special gift for my wife, I decided to buy something special, a personalized romantic gift that speaks volumes and shows her the feelings that I cannot always put into words. 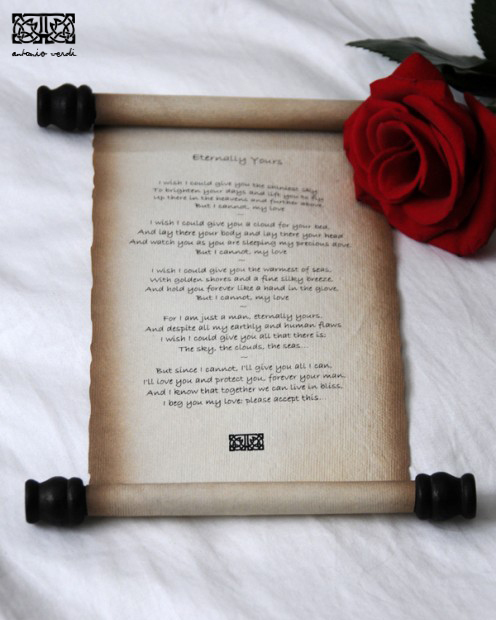 I stumbled across the Words of Love collection by Antonio Verdi, love poems delivered in a COSIMO and, ever impulsive, I decided that this would be the perfect romantic gift for her, something to show that I put a little thought into my Valentine’s Day Gift. 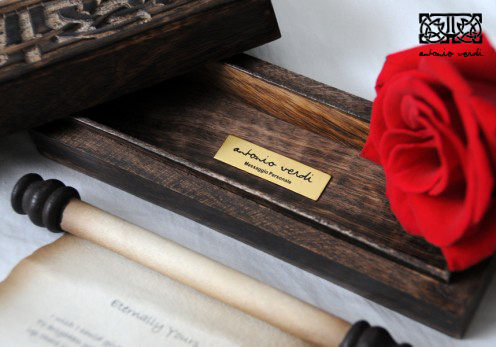 This enchanting personalized gift of a love poem in a COSIMO hand carved box proved to be perfect. 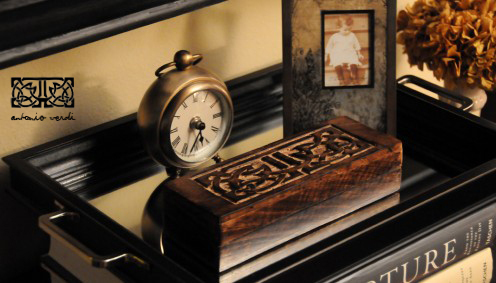 Carved from rich, textured wood, the box is created by an artist who takes pride in their work, every small detail bringing out the soft grain and subtle hues of the living wood. 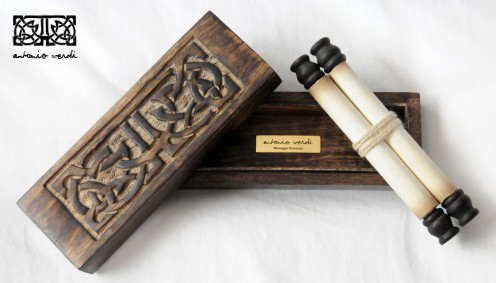 To add to the charm and quality of the box, the scroll inside is an extra flourish, the polished handles wrapped with old-style parchment paper making a perfect Valentine's Day gift or birthday gift for a loved one. I have been known to dabble in woodcarving and I love the feel, smell and texture of natural wood, a world away from laminates and MDF. As I opened the package, I could see and feel the quality and thought that went into the COSIMO, the skill of a master at their craft. Every chisel mark shows the personality of the maker and highlights the care and intricate detail that they put into every creation. Every relationship is different, with its own unique set of ups and downs, each of us wandering along a unique, special route to the same location. 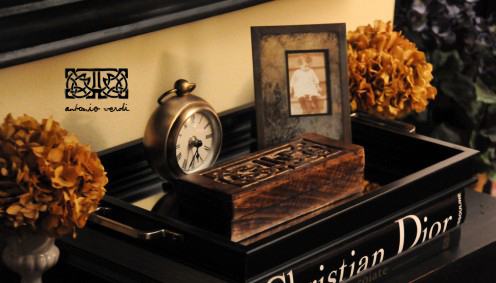 These personalized boxes capture this journey, a unique keepsake capturing both the transience of life and the enduring strength of true love. 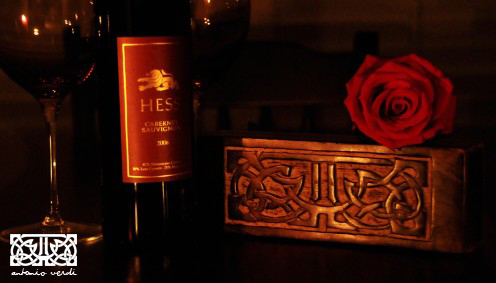 Every component of this romantic gift is constructed from the highest quality materials. 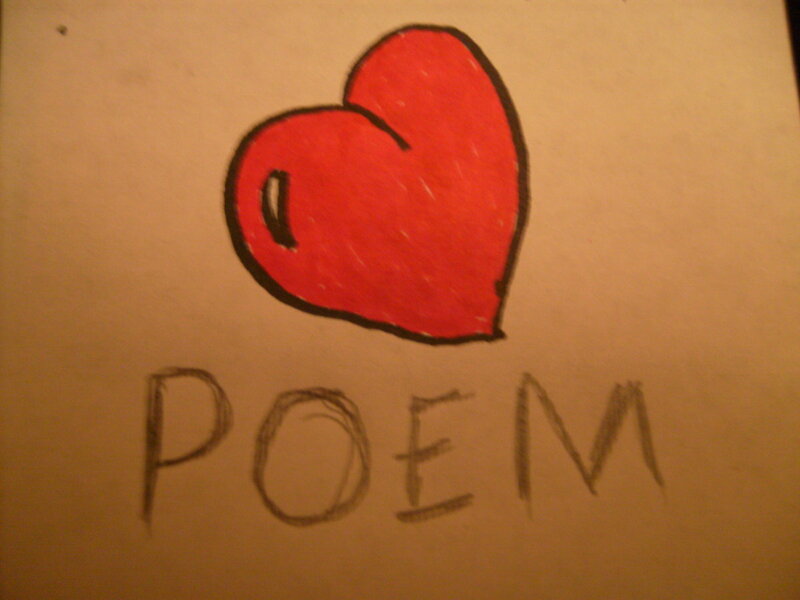 Although I am a full-time writer, I am, quite possibly, the worst poet in the entire world, so finding a ready-written beautiful poem, drawn from the Antonio Verdi Words of Love collection saved her from hearing my lumbering, painful attempts at the poet’s art. 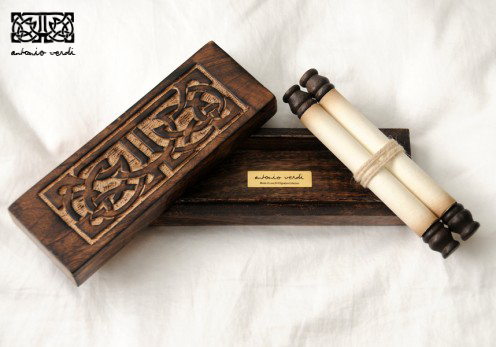 This COSIMO hand carved box contains a scroll with a wonderful poem, powerful words that can reignite passion and strengthen the bonds of love on this special day. Too many men leave their Valentine’s Day gifts until the last moment, rushing into the 24/7 store on the way back from work and throwing a few bucks at a straggly bunch of flowers and cheap, heart-shaped chocolates. 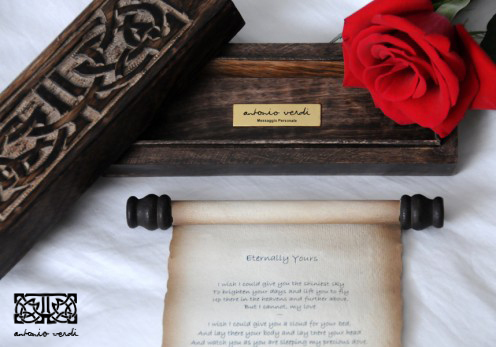 This hand-carved wood box with poem shows the love of your life how much you care, giving her something to keep forever. Instead of the impermanence of blooms that fade and wither, this gift is something that she can treasure for the rest of her life. 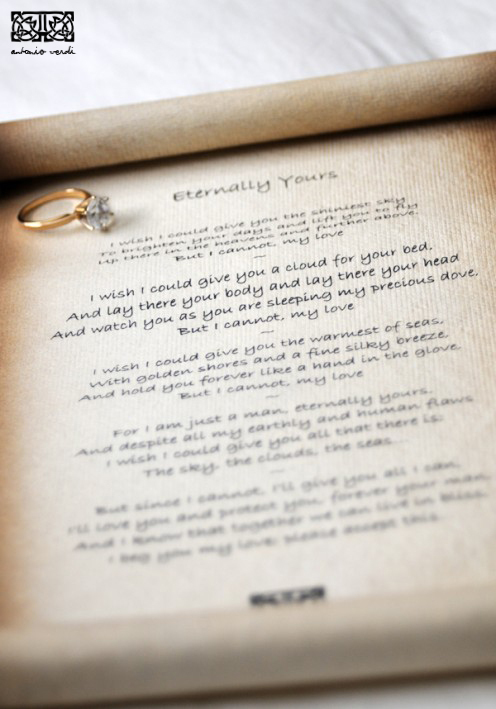 For Valentines Day, an anniversary, or just to show that you care, this COSIMO by Antonio Verdi, complete with romantic poem, is the perfect gift, a memento to hold memories and help you cherish every moment you spend together. 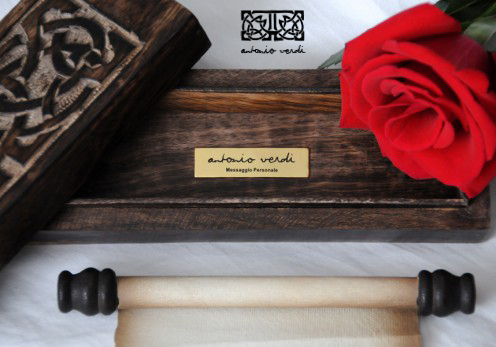 Personally, I cannot recommend the Antonio Verdi love poems in a COSIMO handcarved box highly enough. 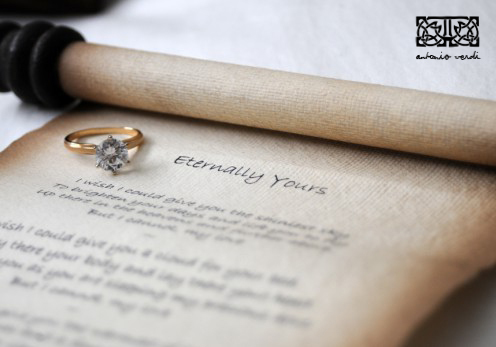 As a thoughtful romantic gift for her that shows you care, this is a present for life, an elegant gift that will endure through life’s ages. 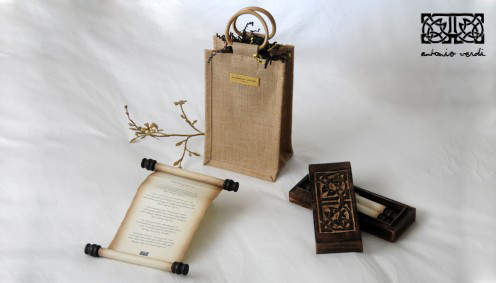 With the 'Aged' look, the parchment-style paper used for this romantic gift is of the highest quality. 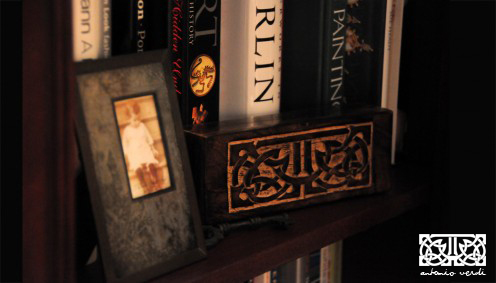 this a great gift which will sit on a side table for years adn reminder her evertime she passes it. I did think about the personalized touch, but I am the world's worst poet! @Eiddwin - The Welsh countryside certainly is well worth seeing in the spring. It is a long time since I visited Wales, but hope to visit again. Great hub, you really put in a lot of effort to make this very informative. I have an antique birds eye maple box chosen by a special friend as a wedding gift and I cherish it even as I cherish her. You certainly nailed it with this gift. Only improvement would be an original poem, in my opinion-- or a personal letter. How can we slip this article to my husband's morning news? This is such a touching romantic gift. I love handmade gifts. Thanks for sharing. What a sweet thing for you to do! 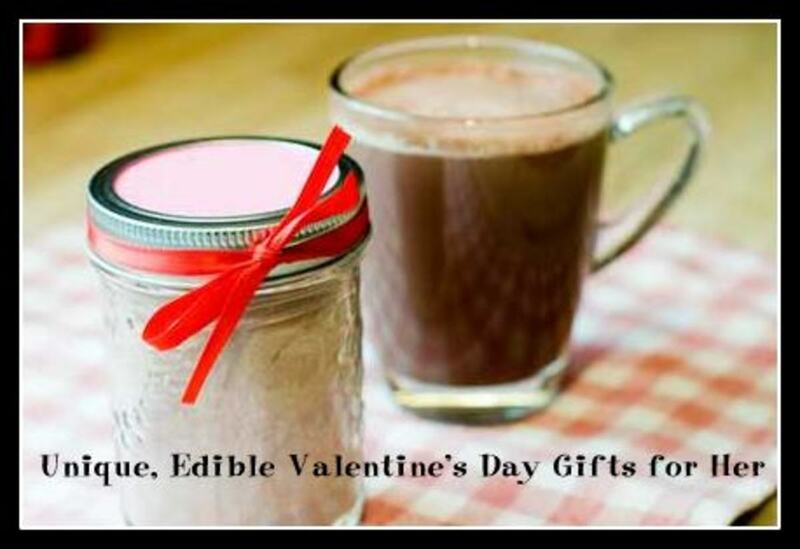 This is a fantastic Valentine's gift idea. Ha well there we are, we know better now don't we! Ha ha! Yes I am looking forward to the spring. I think it is my favourite time of year and love to witness the beautiful welsh countryside spring to life. 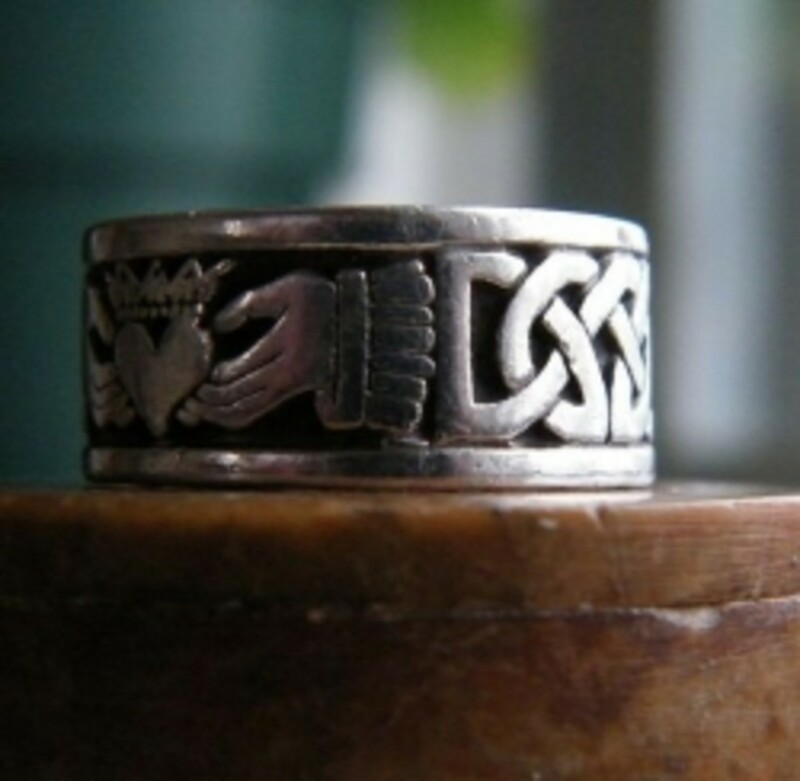 I loved this hub, so thoughtful and a great gift for those we love. I'm sure your wife was thrilled. 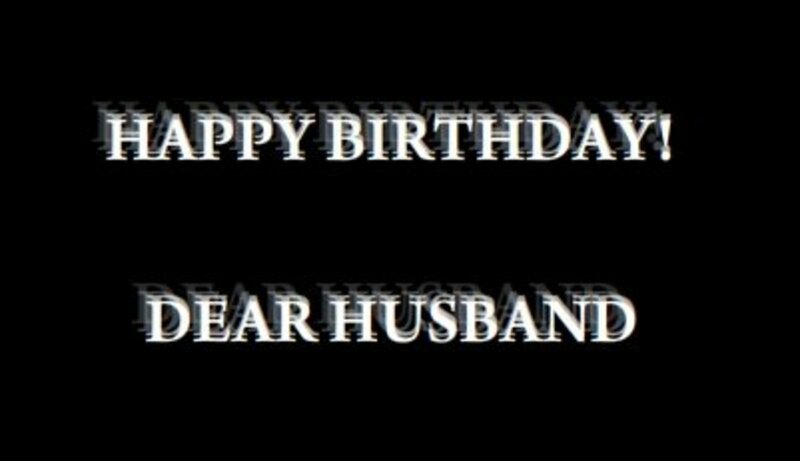 What you did for your wife is so sweet, so thoughtful and so romantic. She must be very touched. 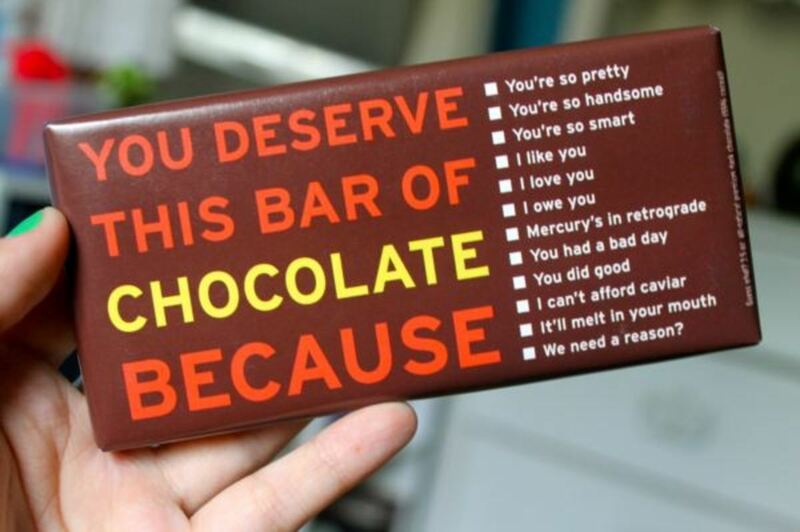 Such a thoughtful gift to give or receive.